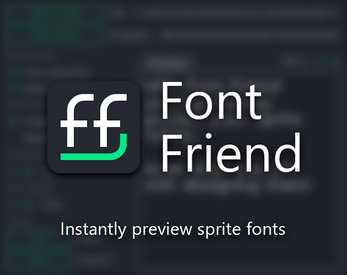 Font Friend is a tool that quickly lets you preview sprite fonts. I love designing pixel art sprite fonts, but always hated how I'd waste time manually moving letters around in my image editor to see how different letter combinations and words look like. I always wished there was a quicker way of previewing a sprite font while designing it. So I made a tool that does exactly that. Just open your image file with Font Friend, define what characters are in the font, and you can immediately start typing. 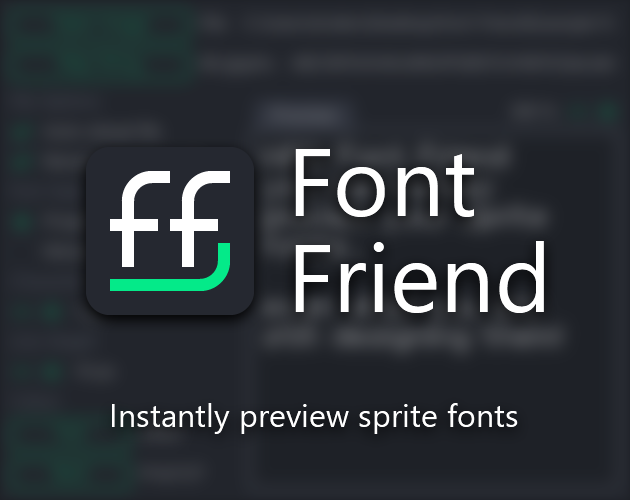 ⚠ Font Friend was primarily created with pixel art sprite fonts for GameMaker Studio 2 in mind, but you can use it with sprite fonts intended for anything, as long as the image is formatted properly. See "Preparing your font" below for details. Quickly preview a sprite font. Auto-reloads on file change, so you can see your changes immediately. Toggle between proportional and monospaced mode. Configure spacing, line height, colour, and more. Please note that Font Friend only has uniform letterspacing, not kerning, as it was designed primarily for pixel art. Currently Font Friend only supports PNG images. Make sure your image is formatted like a horisontal spritesheet. Each frame (the maximum space that a character can take up) should be equal width. The background should be transparent, or a solid colour. An example font is bundled with Font Friend. Click "Open Image" and select your PNG spritesheet. You will be asked to specify a "map string" (which characters are in the font, in the correct order). Click the "Map String" button if you wish to update it later. Configure parameters such as font style, spacing, etc. to your liking. Click on the "Preview" box and start typing! If enabled, Font Friend will automatically reload the image file if it has been changed, so you can see every edit you make in action instantly. If the width of the image changes, Font Friend will assume it is because you added or removed characters in your font. You will then be asked to confirm or update the map string. For bug reports or other comments, throw me a message on Twitter or Discord (baku#3399).